Well, technically, this isn’t my dog. He is here while his parents are gone out of town. His name is Wilson, and he is an Irish-marked Portuguese Water Dog. He has definitely let us know he has a voice and often (too often) demands to be heard. Today, however, he made a noise that I have never heard a dog make so I had to get my camcorder and hope he wouldn’t stop. He yips at first, but in between his yips and yaps, he sounds exactly like a squeaky-toy. Yes, that is him. 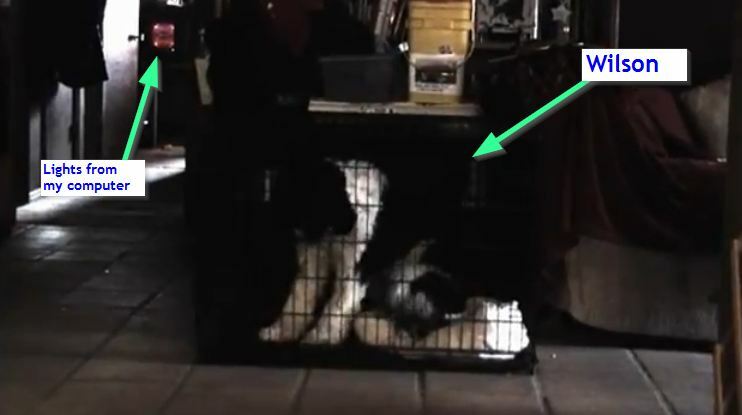 LOL… It sounds like someone is hiding behind the crates and constantly squeezing a dog toy – but there isn’t. I’m the only human at home at this time, and we don’t even have any squeaky-toys in the house… they’ve all been “de-squeaked” by the dogs. And yes, Wilson was let out to potty and play shortly after this video. He had to wait his turn. It’s “organized-chaos”…. LOL. The older I get, the less I know about the sounds animals can make. That crate is too small. Technically, no, it is not. You can see the dog stand up and turn around without any struggle. However, that having been said, we do normally keep our dogs in larger crates. This one happened to be just visiting for a couple days and that was the crate size which was available for him.